The Lake Country CCS Orange Light Cutting Pad will make quick work of your moderate to heavy imperfections! Pair this pad with your favorite polish and watch as the high quality urethane foam construction removes swirls, oxidation, water spots, RIDS, etc. with ease. For best results we recommend following up this polishing step with the CCS White Polishing Pad and your favorite finishing polish. This combo will help you remove lots of imperfections to improve clarity and give you that glossy look we all strive for! But that is not it, this pad features CCS Technology, which takes its performance up a notch. Traditional foam pads can absorb polish too quickly, reducing performance because the polish is trapped below the face of the pad. The CCS Technology solves this problem with partially closed foam cells, or dimples on the face of the pad. These pockets capture and gradually release polish as needed during the polishing process. This feature tends to reduce surface tension, pad skipping, and heat generation with less surface area on the face of the pad being in contact with the painted surface. Less surface area means less friction, which in turn increases polishing performance! All Lake Country CCS Pads are made from the same exact foam as the flat versions, which means no confusion on which color will perform which polishing job. The 3" CCS pads have a diameter of 3.25", making them the perfect size for 3" backing plates! The Lake Country Orange pad is also comes in a flat version (no CCS dimples) as well. If desired, you can purchase the flat version in 3", 4", 5.5" and 6.5" sizes. All of our CCS pads are .875" (7/8") Thick. 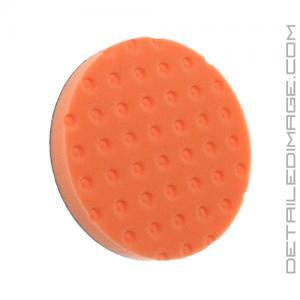 If you have pesky medium to heavy imperfections that need removal, pick up the Lake Country CCS Orange Light Cutting Pad now!